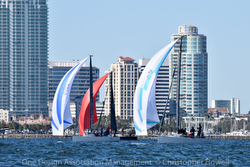 Ending with 15 net points, SPACEMAN SPIFF flipped positions throughout the Championship with Ian Hill’s SITELLA (who placed second with 16 points) to take the 2019 Midwinters title. Then, Andrew & Sedgwick Ward’s team on BRAVO tied with SITELLA on 16 pts, but lost the tie-breaker to take third. The “hard luck” award likely goes to Jeff Davis’ SHAMROCK, going into the last race winning, leading a good part of the last race, then watching SPIFF and BRAVO catch a shift to sweep past them to take 1st and 2nd in the last race to jumble the standings yet again! 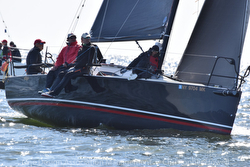 Racing was so tight, that, literally, all four boats were leading the regatta at some point, and all four boats won races (SITELLA- three 1sts, SPIFF/ SHAMROCK- two 1sts each, and BRAVO- one 1st). 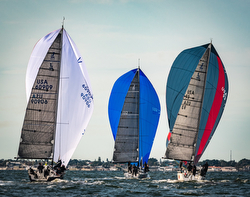 For more J/FEST St Petersburg Regatta sailing information Add to Flipboard Magazine.